Writer and podcaster Liv Siddall kicked off the afternoon of the ModMag17 conference with a raw and comical look at her tenure as editor of Rough Trade magazine. 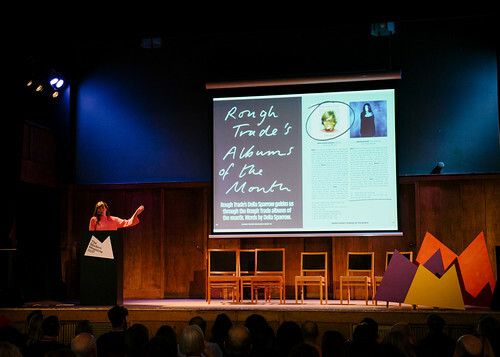 When the opportunity arose to create a monthly magazine for the Rough Trade record shop chain (with three stores in the UK and one in the US), Siddall responded to the vague brief by asking: ‘What if a magazine was a person?’ She enlisted the help of designer Bruce Usher and together – armed with a meagre £1000 per issue budget – they set about ‘documenting the shop, the people, the albums, the gigs and the patrons’ with the aim of bringing what happens behind the scenes onto the page – ‘boxes, Sellotape and passive aggressive messages in scrawled sharpie on all matter of surfaces’. 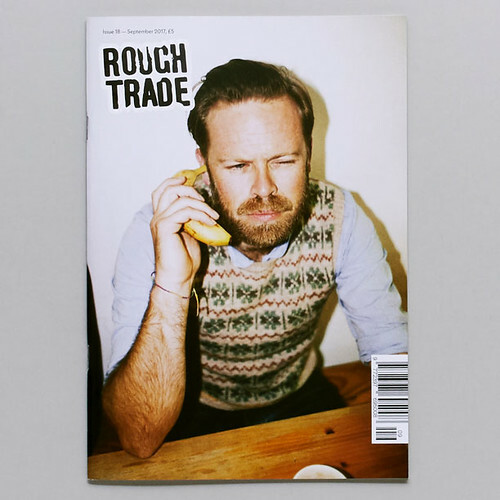 Liv Siddall talks about Rough Trade magazine. 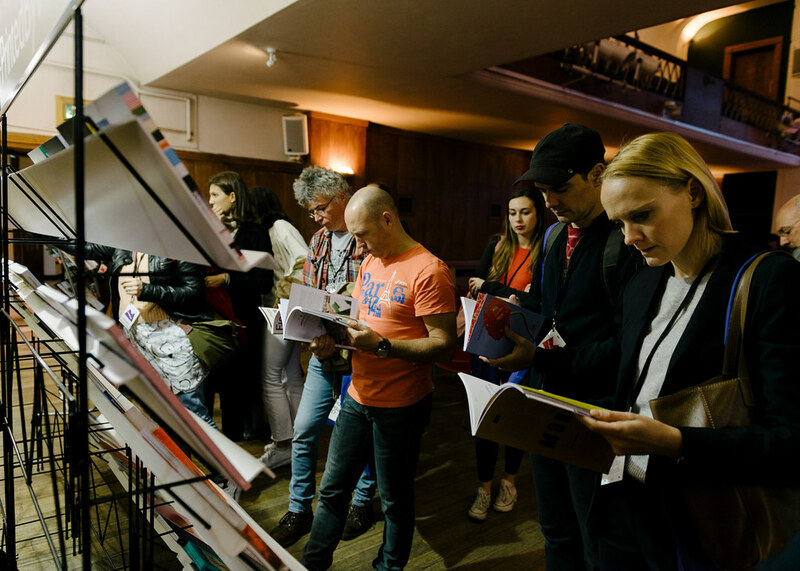 Top: serious browsing at the temporary magazine stall. The financial limitations meant that content was generated and commissioned resourcefully and in contrast to other music magazines. 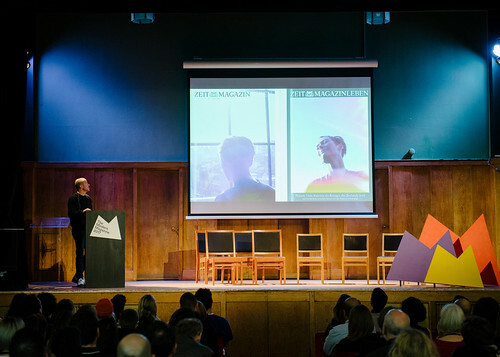 ‘We filled the space by giving the content back to musicians.’ Siddall was grateful to discover that ‘bands love taking pictures of themselves.’ She initially faced pushback from store staff, but she persevered and forged friendships with fellow team members who ‘took greater ownership over the content – getting to see their name in print, and getting the opportunity to interview bands they liked.’ The story came to an abrupt end: after two years of hard graft, Siddall was made redundant on 29 August 2017 and Rough Trade magazine closed. Mirko Borsche talking about ZeitMagazin. Mirko Borsche (Bureau Mirko Borsche) gave a fast-paced talk about the many magazines he designs including Zeitmagazin, Tunica, Spike, Kaleidoscope and Super Paper. While talking about his ongoing work on Zeit, Borsche uttered this memorable mantra – ‘Brush it up every year and never redesign it’ – which offered a frame for viewing spreads and covers for the German newspaper supplement. 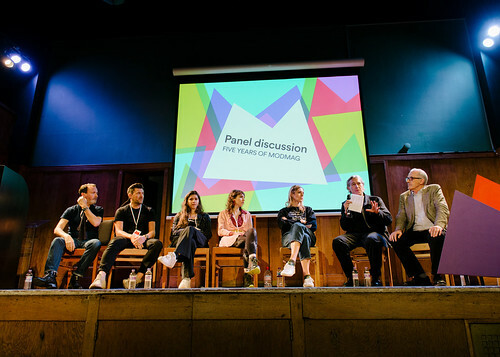 The panel discussion, chaired by Jeremy Leslie, brought together speakers from magazines featured in previous Modern Magazine conferences: Bertie Brandes and Charlotte Roberts (Mushpit), Danielle Pender (Riposte), John L. Walters (Eye), Matt Phare (Shortlist and Stylist) and Paul Gorman (author, The Story of The Face). Magazines (and a book about a magazine) represented on the conference panel. Leslie posed several other questions including: Will you still be making your magazine in five years? If not, what will have ended it? What have you learned making your magazine? The Modern Magazine 2017 panel, left to right: Gorman, Phare, Roberts, Brandes, Pender, Leslie, Walters. Franchi began his tenure as managing editor of La Repubblica by launching the weekly newspaper supplement Robinson, a culture supplement in the Sunday paper. Franchi discussed the shift from magazine to newspaper – a monthly newspaper magazine to a daily newspaper and weekly supplement: ‘The big change working at a newspaper is working with different software which is useful for rapidity but offers less freedom in terms of design.’ But he has found ways around these constraints, saying that he has been able to play with the form, facilitated by developing a wide range of set of templates built in the newspaper software. Franchi’s redesign of the paper launches 22 November 2017. Francesco Franchi, managing editor of La Republicca. 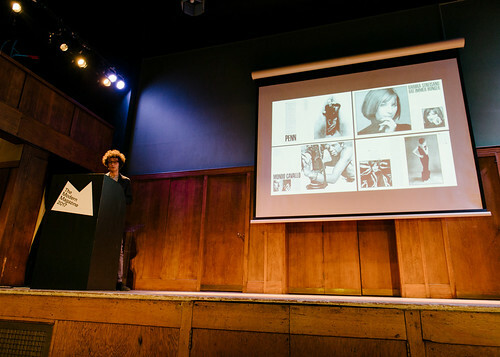 After a presentation James Hyman of The Hyman Archive – a massive collection packed with magazine history – keynote speaker Nicholas Blechman, creative director The New Yorker, took the stage at Conway Hall. Blechman had a captive audience as he took conference attendees through a virtual tour (using his own drawings) of the New Yorker offices at One World Trade Center, which apparently ‘shifts with the wind – it’s very unsettling’. These illustrations maintained the mystery of the place but showed off its key quirky features such as the huge dictionary, placed on an easily accessible lectern like a bible, the current cover framed on the wall (a longstanding tradition) and the area for assessing content in ‘issue A’ and ‘issue B’ – all features that are largely foreign to small indie mag-makers. ‘This isn’t a magazine about design, it’s about longform journalism’, said Blechman. ‘The layout is pretty rigid and basically hasn’t changed since 1925 … These constraints puts a burden on the art, but I work with a tight core group of illustrators’ whose work gives each issue its unique appearance. 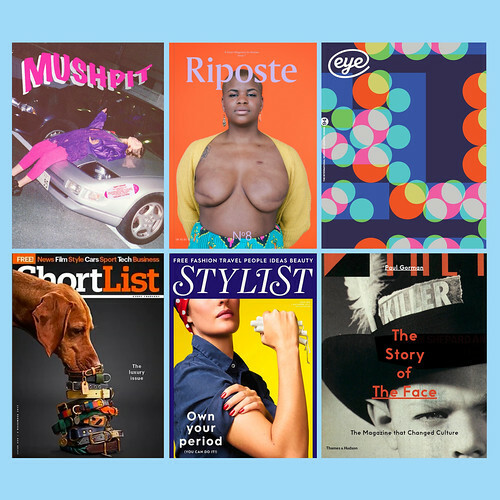 ‘The fiction pages pose an interesting challenge for the design’ which use whole page illustrations or photographs and the magazine’s own typefaces. Nicholas Blechman’s talk continued with numerous other anecdotes and insights into his working life at the New Yorker including tales from the fact-checking department, the magazine’s ‘moral police’. It was a fascinating and fitting way to end this year’s Modern Magazine conference. 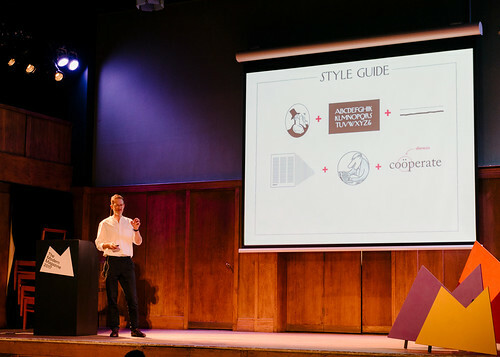 Nicholas Blechman, art director of The New Yorker, showing a slide of elements from the weekly magazine’s style guide, including eccentricities such as the spelling of ‘coöperate’.